It doesn’t get cuter than this. Chrissy Teigen introduced her daughter, Luna, to a fluffy bunny in an adorable Instagram video she posted on Instagram on Tuesday, March 14. “Gentle, gentle,” the supermodel said as her baby girl reached out to stroke the rabbit’s fluffy fur in the video that has been viewed more than 1.5 million times. In the background a llama watched the proceedings and a turkey gobbled. “It’s the Cadbury bunny,” Teigen’s husband, John Legend, could be heard saying of the chocolate-colored bunny. The Oscar-winning singer, 38, also shared a sweet pic of his wife and daughter on Instagram Tuesday that showed them both wearing overalls as they sat in a pen with animals including a baby goat. “Petting zoo party,” he captioned the happy snap. The cookbook author appeared to be even more excited than her 11-month-old as she shared a pic on Twitter that showed her greeting a pony and donkey while wearing a satin robe. “It’s happening,” she wrote. Teigen, 31, giggled in another Instagram video, captioned, “Dreams come true,” as she snuggled a tiny piglet as chickens, a duck, a calf and other barnyard animals surrounded her. 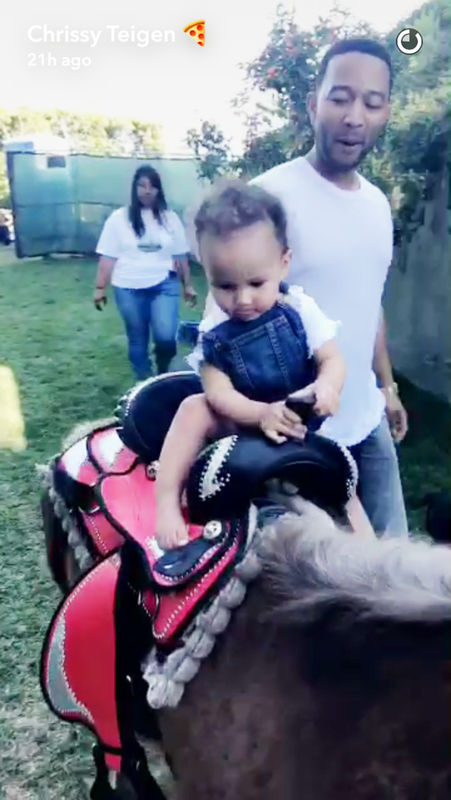 She also shared a series of Snapchat videos, including one that showed Luna, who turns 1 on April 14, riding a pony while Legend held onto her protectively. But life isn’t all about cuddling baby animals (we wish!). The Lip Sync Battle cohost also headed back to work this week for the Spike show’s new season and posted a pic on Instagram on Monday, March 13, showing the “All of Me” crooner laughing with Luna as they lounged around on the set.